I sometimes think that I pay for too many subscriptions to genealogy databases, but a discovery on Myheritage.com has made me rethink a tightening of my budget. The other day I was working on a brick wall for my husband’s family. I had been searching in vain for the true parents of his second great grandmother, Adema Jane Jeffrey Carter. On Ancestry.com, I found her, age 14, listed in the 1860 US Federal Census living with William McClelland Jeffrey and his wife Elizabeth in Randolph County, Illinois. However, it appeared that Adema was too old compared to the other children. (1) I suspected that William had had a prior marriage, and Adema was born during that marriage. Many of the children who were listed on the 1860 census eventually relocated to Azusa, California, which is where Adema died. After failing to find the 1850 census record for Adema on Ancestry.com, I logged onto my MyHeritage account. I don’t use MyHeritage too often because I am not used to its setup. I searched for Adema in the 1850 U.S. Census and there she was listed as Adema J. Geoffrey, age 4, in Randolph County, Illinois, living alone with William M. Geoffrey. (2) Bingo! For some reason, MyHeritage retrieved the record with her misspelled last name right away. I then checked the public trees on MyHeritage and found a tree with William McClelland Jeffery married to Jane Jeffery (born Gray) in Randolph County, Illinois on 3 May 1845. (3) Adema’s middle name was also Jane. Adema’s birth date was about 1846 (4) or 1847. (5) Jane may have died young, because William married Elizabeth Barnfield on 5 Feb 1852 in Randolph County, Illinois. (6) A divorce is also possible. The MyHeritage tree does not indicate that Jane and William had children, but that does not mean Adema was not born to this couple. I know that you can’t rely on online family trees too heavily in your research, but they sure can give you wonderful clues. This exercise proved to me that, even though the cost of subscription databases can add up, it is not a bad idea to subscribe to more than one if possible. Their search engines work differently, and you have a wider field of trees and other sources to review. Locate a birth record for Adema Jeffrey. Locate a death record for Jane Grey/Gray. See if there is a divorce record for Jane's marriage to William. Investigate whether there were other children born to the marriage of Jane and William. Contact the MyHeritage tree owner to compare notes. Check early newspaper articles in Randolph County, Illinois for clues. Investigate the microfilm holdings for Randolph County, Illinois in the FamilySearch Catalog. Church and probate records, in particular, might be helpful. Dover Publications, Inc., Mineola, New York, Electronic Clip Art, "Old-Fashioned Silhouettes," 2001. Dover Publications, Inc., Mineola, New York, Electronic Clip Art, "Decorative Silhouettes," 2003. (1) 1860 U.S. census, Randolph County, Illinois, population schedule, Township 8 S Range 5 W; Roll: M653_221; Page: 1012; Image: 570; dwelling 3126, family 3136, Adena J. Jeffry; digital image, Ancestry.com (http://www.ancestry.com : accessed 14 Mar 2014); citing National Archive microfilm publication M653, 1,438 rolls; imaged from FHL microfilm 803221. (2) 1850 U.S. census, Randolph County, Illinois, population schedule, Town of South Range 5 West, Family 929, Image 378; dwelling 924, family 929, Adema J. Geoffrey; digital image, Myheritage.com (http://www.myheritage.com: accessed 14 Mar 2014). (3) Gray Web Site, REGray, owner, Family Trees, MyHeritage Ltd., copyright 2006-2014 (www.myheritage.com: accessed 14 Mar 2014). (4) Op cit., 1860 census. (5) Entry for Adema J. Carter, Ancestry.com. California, Death Index, 1905-1939 [database on-line]. Provo, UT, USA: Ancestry.com Operations, Inc., 2013. Original data: California Department of Health and Welfare. California Vital Records-Vitalsearch (www.vitalsearch-worldwide.com). The Vitalsearch Company Worldwide, Inc., Pleasanton, California. 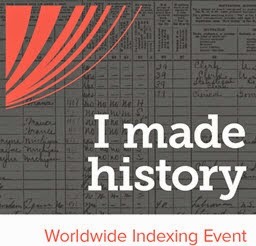 (6) "Illinois Marriages, 1815-1935," index, FamilySearch (https://familysearch.org/pal:/MM9.1.1/V2PZ-NDJ : accessed 15 Mar 2014), Wm. M. Jeffrey and Elizabeth W. Barnfield, 05 Feb 1852; citing Randolph, Illinois; FHL microfilm 975009. (7) Entry for William M. Jeffrey; Source: Dodd, Jordan. “Illinois Marriages to 1850,” Ancestry.com: accessed 15 Mar 2014; Original data: Electronic transcription of marriage records held by the individual counties in Illinois.